Quickly get money personality reports. Talking about Money can be hard. But it’s easy with Money Habitudes. It’s simple: Read some statements. Decide if you agree or disagree with each. Whether you use the cards or the online version, you’ll get instant feedback about your money personality — your financial habits and attitudes. A quick, fun and effective way to help clients discover their money personality. Users get a personalized report. Plans available for professionals: financial planners, therapists, financial educators. A money personality staple, Money Habitudes cards have been the go-to resource for talking about money for more than 15 years. Fun and non-threatening, they’re available for Adults (English, Spanish) and Teens. 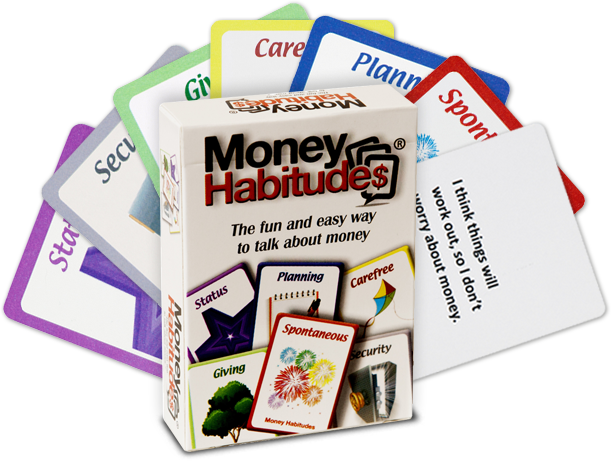 Add your own logo, branding, contact information and more to decks of Money Habitudes cards. Customize a panel on the box and a double-sided card in each deck. Great for giveaways and workshops. A number of companion guides help you better use Money Habitudes cards, while offering additional questions, financial conversation starters, and insights into money personality issues. Better understand financial habits and attitudes and how to use Money Habitudes cards with this DVD. For financial, counseling and coaching professionals working with clients. This fun and easy curriculum helps teens identify financial patterns and how those affect their relationships and goals. Winner of an Excellence In Financial Literacy Education Award. Money Habitudes helps professionals and their clients. Money Habitudes is an engaging, non-threatening way to help people recognize patterns and perspectives on money. It has really opened up some fantastic conversations and helps to build relationship and understanding with clients. Money Habitudes® is trusted by thousands of Financial Planners, Educators, Therapists, Universities & Non-Profits.